As footy fans get giddy with excitement for the upcoming AFL season, each club has a certain something to be thankful for. For some, it’s a chance at redemption, while for others it’s an opportunity to see a young list develop. Whatever the case, each 18 club’s reasons to be grateful are assessed below on the eve of season 2019. The Crows give an almighty thanks that the year is now 2019, and not 2018. A season from hell last year saw them spectacularly drop from premiership hopes to non-finalists amid the constant controversy of a botched pre-season camp. This year, however, things will surely be different. Experts are tipping the Crows to be back in a big way, while a recent fan survey suggested they’ll storm back into the top four. With a fit-again Rory Sloane and Crouch brothers, could Adelaide rekindle their 2017 form and make it to the big dance? The Lions give thanks for the overwhelming positivity coming out of their camp, in contrast with recent years. Chris Fagan’s side were given a big tick of approval after a 2018 campaign that yielded just five wins. But with an exciting core of young kids and the addition of some strong talent in their prime (Lachie Neale, Jarryd Lyons, Marcus Adams), the Lions are considered a chance to make their first finals series since 2009. Will the burden of expectation prove too much? It’s possible, given they’ll need to considerably up their wins column should they expect to feature come September. The Blues say thanks to the footy gods (and, well, the draft system) for possessing arguably the most watchable young talent in the competition. With Patrick Cripps they have a bonafide star, and with Charlie Curnow and forward that will benefit from another pre-season under his belt. Number one pick Sam Walsh had fans cheering every possession during the pre-season, while hopes remain high for Paddy Dow and Jacob Weitering. Can the young guns improve on last year’s two wins? The Pies will be thankful that their list is shaping up even better than 2018, a season they were a kick away from winning the premiership. With Dayne Beams back in the fold, plus fit-again Jamie Elliott and Darcy Moore, and new recruit Jordan Roughhead, Nathan Buckley’s side make a compelling case. Their draw, however, is tough to begin with. They face Geelong, Richmond and West Coast in the first four rounds. If they can chalk up two wins in that bunch, they’ll hit the ground running. Dons fans already gave thanks many months ago, with the acquisition of star midfielder Dylan Shiel in the trade period. But how hopeful are they now? Sure, they’re expecting a return to the top eight. But after a lacklustre showing in the JLT series and an injury which could see forward gun Joe Daniher out for the first month, hopes may be slightly tempered. We’ll get a good indicator early, with games against GWS and Melbourne in the first three rounds. Freo and Ross Lyon will be thankful for their favourable draw to kick off season 2019. Their first three rounds read: North Melbourne, Gold Coast and St Kilda. But this could also be a double-edge sword. Should they fail to win at least two of these games, they could be behind the eight ball for the first half of the season. The big plus for Freo in the off-season was snaring Jesse Hogan and Rory Lobb. But with that came the loss of Lachie Neale, who has shouldered much responsibility in recent AFL seasons. The Cats give thanks for a much-needed injection of speed with the addition of Luke Dalhaus and Gary Rohan. And with Gary Ablett set to move forward, could they have a finals-bound forward line? The Cats remain a difficult side to read, after being bundled out of the finals in straight sets last season. Their midfield class is undoubted, but whether they have enough depth to go again remains a serious question. The Suns can be thankful for, ahem *checks notes, picking up some guns in the draft? Truth be told, there’s not much Gold Coast can give thanks for. With the loss of Tom Lynch and Steven May, an enormous hole sits in the spine of this struggling AFL outfit. And while coach Stuart Dew is doing his best to create what is an improving culture, the Suns will surely struggling in season 2019. Draft picks in Lukosius and (pending return from injury) Rankine will be exciting to watch, however. The Giants are thankful there’s now enough cap space to hang onto stars like Josh Kelly and Stephen Coniglio. That has, however, come at a cost. The off-season saw them lose Dylan Shiel, Rory Lobb, Tom Scully and Ryan Griffen (retired). Despite this, the Giants have a core group that can feature with the AFL’s best. With Jeremy Cameron and Toby Greene they have one of the competition’s most lethal forward line, and have the ability to blow sides out of the water. Consistency, as usual, will determine their 2019 finish. Rather than giving thanks, the Hawks were cursing their luck when Brownlow medal winner Tom Mitchell went down with a season-ending leg break in January. But an unexpected (potential) return to new-new-recruit Tom Scully could temper those ill-thoughts. As usual, Alastair Clarkson was busy in the trade period. Chad Wingard joins the ranks, while another Mitchell – Sam – comes in from West Coast in a coaching capacity. The Hawks are too good to drop completely out of contention, but face an uphill task to make the eight in AFL season 2019. The Dees give thanks, still, for a 2018 that brought so much hope and enjoyment back to the club. They want to continue riding the wave, however, and have strong expectations for 2019. While the loss of Jesse Hogan leaves the forward line perhaps over-reliant on Tom McDonald, Steven May’s signature makes them a formidable defensive unit. Now is the time to strike, we are hearing out of Simon Goodwin’s camp, and expect much out of the Dees this year. With a core not overly blessed with pace, the Roos are giving thanks they’ve snapped up Jared Polec and Aaron Hall. Once again, they’ll be teetering on the edge of the top eight, and will need things to go their way to squeeze in. Brad Scott runs a tight ship at Arden Street, but their depth will be tested this season. Ben Brown can’t continually shoulder the load up forward, and will need a chop-out from the likes of Mason Wood. Port fans will be thankful for the relatively quiet off-season at Alberton, bar a water skiing accident to co-captain Ollie Wines. Last pre-season, the Power’s list was rated second-best in the competition by Champion Data. But they could only manage 10th in a stop-start season. Plenty of questions remain for Ken Hinkley’s side, like whether they have enough match winners to get things done in the business end. They are too experienced a side to drop down, but may not have the strength to go deep. Another side who could teeter on the edge of the eight. The Tigers faithful will be thankful that footy’s back because, well, they are absolutely flying. It’s a lovely time to be alive for Richmond fans. The story of their off-season was the huge coup of Tom Lynch, but they also remained largely injury-free. 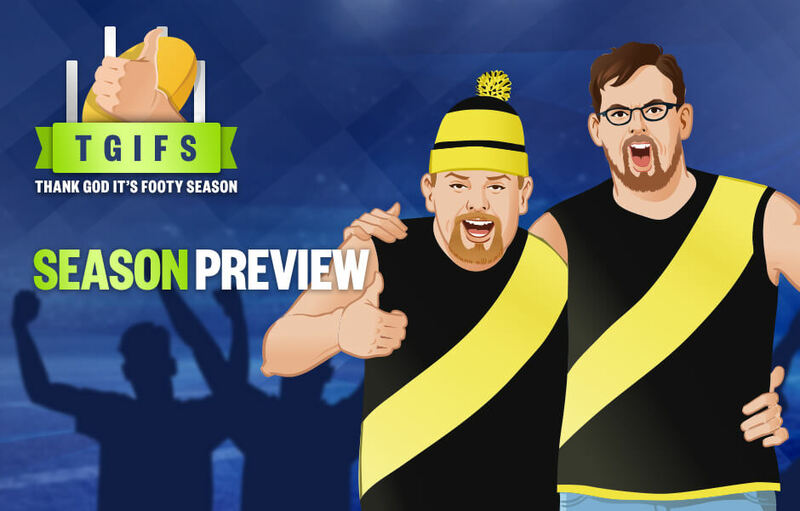 It makes sense they’re the premiership favourites with Palmerbet ($5) and will be desperate to atone for last year’s shock preliminary final loss to the Pies. Almost undoubtedly will finish in the top four, so the main question that remains is whether they can get in done again in September. The Bloods give thanks that this year, yet again, the so-called experts have written them off. Almost every year, at this exact time, a swathe of pundits will claim that this – finally – is the year the Sydney Swans bottom out. ‘They’ve been up there too long’, ‘They need to bottom-out at some stage’ the experts claim. A quick glance at season previews across a number of platforms confirms as much. Many claimed the Swans won’t make the top 8. But the thing is, they do almost every year. Incredibly, since 2003 the Bloods have missed out on the finals just ONCE. It’s an incredible record. Will they add another year of September action in 2019? Saints fans can be thankful for very little, unfortunately, at this point. With three vital players in Jake Carlisle, Dylan Roberton and Jack Steven out indefinitely, it hasn’t been the best lead-in for Alan Richardson’s side. The coach is already on thin ice, and if (or for some, ‘when’) the losses mount, he is likely to be on the chopping block. The Saints appear headed for a bottom-four finish. Whether they can exceed last year’s total of four wins remains to be seen. Eagles fans will be thankful that next week, they’ll be able to unveil their premiership flag. And who wouldn’t be thankful for that? A stunning 2018 AFL season saw Adam Simpson’s side time their run perfectly, seeing off a talented Collingwood outfit in one of the best Grand Final’s in recent times. Can they muster the hunger and desire to go again? With Andrew Gaff back and a dominant record at their new home at Perth Stadium, it has to be said: why not? The Bulldogs give thanks that one of their premiership stars, Tom Liberatore, is back for season 2019. How much influence he can have is yet to be seen, but they desperately require his in-and-under ball-winning ability. With two largely fruitless campaigns following their incredible 2016 triumph, the Dogs have been on the decline. Their pressure-football that earned them the flag has yet to return. Will this be the year it does? Coach Luke Beverage has a huge job on his hands.